humangivens.com – The Human Givens Publishing shop offers books, CDs and Monographs about a wide range of subjects including: psychology, human behaviour, effective psychotherapy, guided imagery and relaxation, depression, anxiety, addiction, anger, trauma, emotional intelligence, the power of stories and metaphor, and why we dream. Everything we publish is produced in clear, jargon-free language so that this often much-needed information is easily accessible to as wide an audience as possible. hgonlinecourses.com – NEW online courses from Human Givens College, including FREE online lectures and online versions of the College’s most popular courses, including How to break the cycle of depression and Tackling Addiction. hgi.org.uk – The Human Givens Institute’s official website – further information on depression, dreaming, anxiety, addiction, trauma and psychosis. Also contains archived articles from the Human Givens Journal and a register of Qualified Human Givens Practitioners. humangivenscollege.com – Human Givens College, training in the best ways to help people suffering from emotional and mental health problems, including depression, PTSD, anxiety disorders, addiction and more. Offering one- and two-day workshops, seminars and the Human Givens Diploma course including courses about depression. hgfoundation.com – The Human Givens Foundation – Its objectives are to promote research and public education into the ‘givens’ of human nature and their application into the treatment and care of those suffering from mental illness. blog.humangivens.com – The Human Givens blog serves to promote knowledge and discussion of human givens ideas and articles of interest relating to psychology, mental and emotional health and well-being, and more. 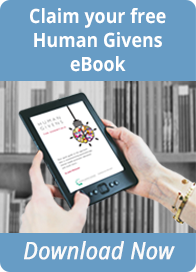 Sign up for the Human Givens e-newsletter – The HGI produces a regular email newsletter, keeping everyone interested in the human givens approach up to date with the latest developments in its ongoing work to bring humanity and common sense into mental health, education, social work and so on. We do not pass on email addresses to any third parties. >> Please note the Human Givens Institute is not responsible for the content of external websites!